A number of indicators which had been positive have either now turned neutral or are on the cusp of turning neutral. This morning's preliminary reading of Q1 2018 GDP at +2.3%, down from the previous quarter's +2.9%, was generally in line with forecasts. As usual, my attention is focused less on where we *are* than where we *will be* in the months and quarters ahead. There are two leading components of the GDP report: real private residential investment and corporate profits. Because the latter will not be released until the second or third revision of the report, I make use of proprietors' income as a more timely if less reliable placeholder. According to Prof. Edward Leamer, this typically peaks about 7 quarters before the onset of a recession. As it has not made a new high since four quarters ago, and must be considered a signficant leading indicator of recession at this point. Remember that the big decline in corporate profits in Q4 of last year had to do with accounting for repatriation of overseas earnings in the recent tax bill, so right now proprietors income is probably giving us the more accurate, positive, signal. 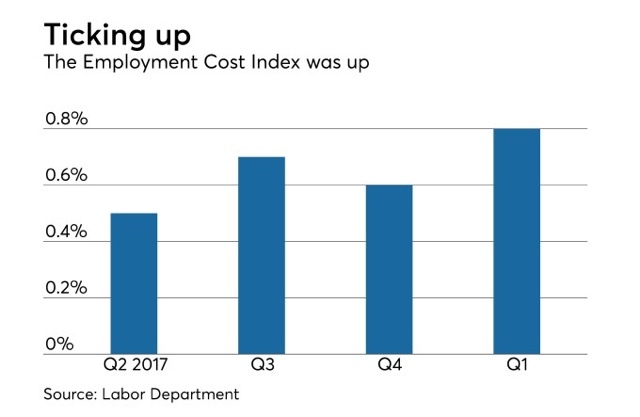 While the economy is very likely to continue to grow through 2018, together this most recent data suggests a more questionable picture heading in 2019. In particular, this is the first important housing metric to roll over to negative. Since the YoY% change in permits for 2015-17 was roughly 10% (divided by 4 for purposes of scale in the above graphs shows a number of ~2.5%), I wrote that a continued roughly 2.5% YoY growth of GDP for the next few quarters is a reasonable projection. There are two particularly good things about this: (1) it is a median metric; and (2) unlike other wage measures, it tracks pay for the same job over time. 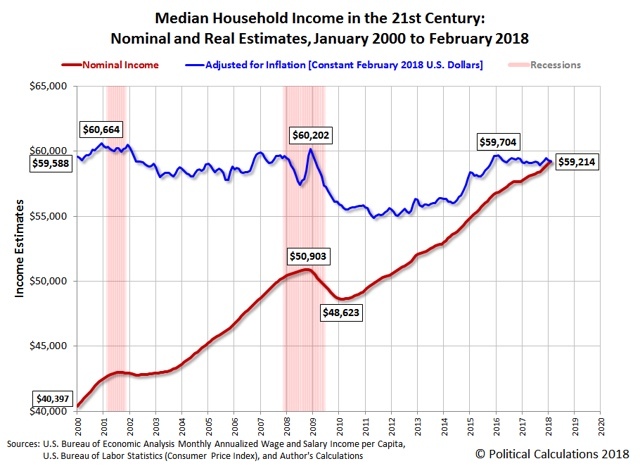 This tells us that the growth in pay for doing the same job has begun to rise significantly (UPDATE: and is clearly in an uptrend), a big plus in what has otherwise been a mediocre wage picture. Yesterday the BLS issued its report on Q3 2017 Business Employment Dynamics. This has gotten some notice because, for the first time in 7 years, it showed a net loss last summer of -140,000 jobs. As an initial matter, this is a good time to remind you that the data is the data is the data. It's not partisan. I've seen some of the same people who were touting "It's still Obama's economy" all last year (and I agree with that) now suddenly saying that the Q3 BED job losses show that "the Trump/GOP economy is tanking" No, they don't. While job losses in Michigan and Ohio might not be so unexpected, for major job losses to happen in Florida sticks out in the data like a sore thumb. While hurricanes and wildfires occur every summer, last year was a particularly bad one. And a look at the three states most directly involved -- Florida, Texas, and California -- tells us exactly what happened. The BLS appended a note expressly stating that they did not adjust for this. The net loss of -171,300 jobs in Florida alone compared with the previous quarter exceeds the net nationwide loss of -140,000. Add in the other two states affected by unusually severe disasters and you get a net loss of -224,200 jobs. Does anyone seriously think the Florida economy suddenly went to hell in Q3 of last year in any cyclical manner? Of course it didn't. So I'm not putting too much stock in this report. This morning they made a new 48 year low, at 209,000. Wow! When The End is really Near, I'll tell you. If my systems are right, hopefully about a year in advance. If the economy is left to its own devices, The End is not Near now. Way back during the Great Recession, I first noted that demographics were about to become a tailwind for the housing market. 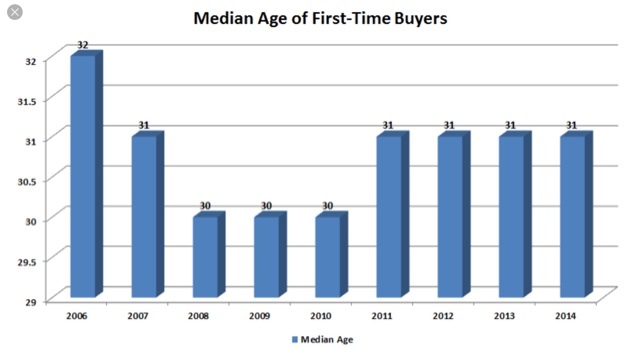 The argument, in its simplest terms, is that the median age of first time home buyers is about 30, and the nadir of the "baby bust" was 1973-76. 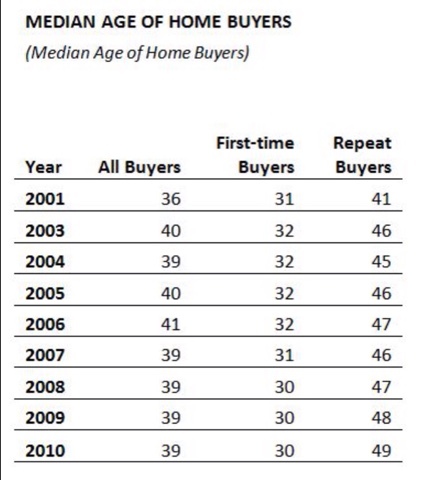 That means that the demographic nadir of the population of first time home buyers who ultimately drive the market (since everybody else just moves up from one house to another) was in the 2003-06 period. Yesterday I started looking into quantifying that tailwind. Without getting into too much detail, my suspicion is that it has amounted to an increase in the pool of potential first buyers on the order of roughly 250,000 households per year since 2010 -- i.e., the increase of each year over the year previous, continuing year after year. That's just a back of the envelope approximation. Lo and behold, Bill McBride a/k/a Calculated Risk posted on a similar subject yesterday, opining that the demographic tailwind was likely to continue for years for both housing and the economy generally, concluding that "My view is this is positive for both housing and the economy, especially in the 2020s. "Then Mike Shedlock a/k/a Mish responded with regard to housing, opining that "On the surface, the demographic trends may appear neutral or slightly favorable.... [but] For now, and the next five years, attitudes and affordability are the key issues. They far outweigh any potential demographic benefit, if any." Who's got the better argument? Because historically we've been around this block before, in a pretty big way. You may have heard of it: it was something called the "baby boom." In my opinion that history gives us a pretty definitive answer. 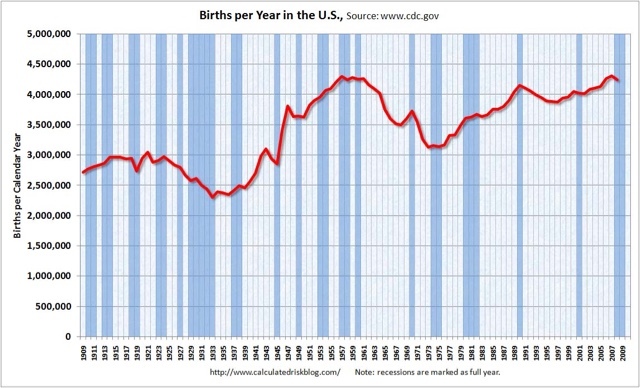 Between 1900 and 1945, live births averaged about 2.75 million a year -- more during the prosperous 1910s and 1920s, followed by a bust during the hard times of the 1930s. Then, in the 20 years from 1945 to 1965, live births averaged 3.75 million a year. Officially, it has been estimated that there were 76 million "baby boomers" by the end of this period. This was a huge, huge increase unlike anything before or since over the entire 120 year period. The US population as a whole increased from 140 million in 1945 to 195 million in 1965. The median age of the US population was 28 years old. When we consider that about 75 million of that 195 million population had been born during that period, that means that almost 40% of the entire US population were legally children (21 being age of majority at the time) in 1965! Like I said, huge. Just huge. Even the slightly numerically larger Millennial generation, nor the post-Millennial iGeneration have come remotely near that kind of percentage. The "baby boom" was demographically nicknamed "the bulge in the belly of the python" as will be apparent in the shape of the graphs below. While the demographic "bulge in the belly of the beast" is indeed obvious (! ), real GDP growth YoY has generally been in a persistent downtrend for the last 70 years. There is simply no evidence of economic acceleration during the period that the large Boomer demographic dominated the prime age workforce. The correlation of the economy and prime age workforce demographics is entirely an artifact of the years since 2000, and falls apart upon longer-term historical examination. But with housing, it's a different story entirely. There are huge surges and declines between 1965 when the oldest Boomers reached age 20, and 1985, when the youngest did, and the oldest reached age 40. Permits for multi-unit residences surged first, beginning in 1965, as the oldest Boomers entered their 20s, while single family permits, relatively speaking, began to surge in the early 1970s, and reached their peak in the early 1980s. This is exactly what we would expect to see as the young demographic moves from apartments and condominiums into single family homes. 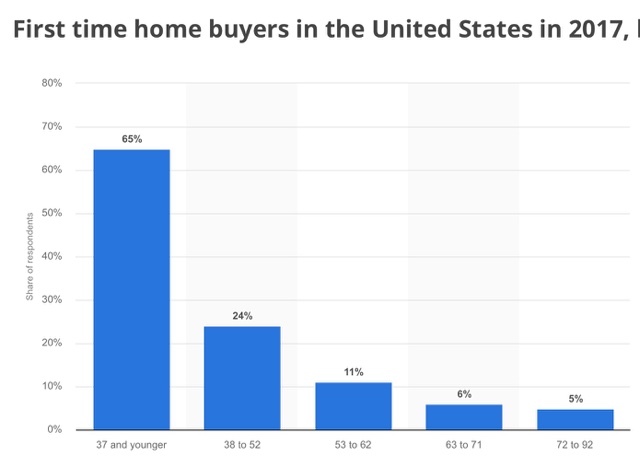 By 1986, there gradually became more Boomers exiting the prime first time home-buying age demographic than there were younger persons entering that demographic. Note that we've seen an echo of this pattern with the entry of Millennials into adulthood. During the housing bust, single family permits fared much worse than multi-unit permits, and multi-unit permits initially surged more than single family permits -- but since 2010, both have surged more than at any time since 1985. The peak in Millennial births was in 1990, after which live births leveled off. If a similar historical pattern is followed, the strong demographic tailwind in the housing market should continue through 2020, and thereafter, while not turning into a headwind, gradually subside through roughly 2025. Housing: it's Godzilla vs. Mothra! In this corner, I give you Godzilla -- the large generational tailwind of Millennials entering the market! 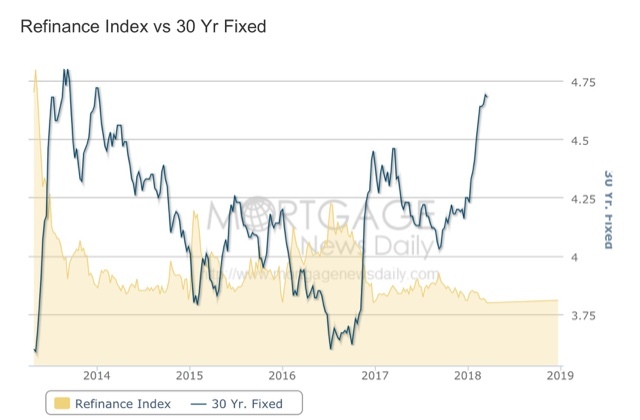 And in this other corner, I give you Mothra -- increasing interest rates that have now broken a 30 year trendline together with price increases of over 5% a year! Pull up a chair (at a vary safe distance), because we don't know yet who is going to win -- but you don't want to get caught in between them. This post, with monstrous graphs, is up at XE.com. In addition to my "long leading/short leading" model adapted from the work of Profs. Geoffrey Moore and Edward Leamer, and the "high frequency" weekly variation on the same, I also have several "alternate" recession forecasting models. The most noteworthy model is really a consumer nowcast. It turns on consumers running out of options to to continue increasing purchases (i.e., no interest rate financing, no wage real wage increases, and no increasing assets to cash in). When that happens, and consumers turn more cautious by saving more, a recession begins. I first posted the model 10 years ago under the title, "Are Hard Times Near? The great decline in interest rates is ending." The history is straightforward. Since the 1970s, real average hourly earnings had declined. Average Americans coped by spouses entering the workforce, by borrowing against appreciating assets, and by refinancing as interest rates declined. By 1995 the spousal avenue peaked. Borrowing against stock prices ended in 2000. Borrowing against home equity ended in 2006. When interest rates failed to make new lows, the consumer was tapped out, and began to curtail purchases. A recession began - and its effects lingered for a long time. "Hard Times" had indeed begun. What does the consumer model show now? I haven't updated it in about two years, and there have been noteworthy developments. Let's take a look. Of course, there's nothing to preclude it making new highs later this year, but for the moment, that method of freeing up cash is stalling. So consumers are more stretched than earlier in the expansion. For this model to signal recession, consumer debt obligations would have to start to fall. Put this all together, and we have consumers in a more precarious position than they have been at any previous point in this expansion. 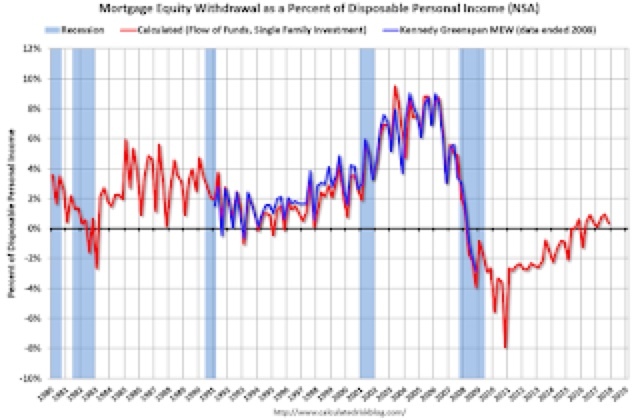 But on the other hand, home equity withdrawals are still an option and are being used. The most recent available data does not show consumers becoming more focused on paying down debt. As with my primary forecasting model, the lynchpin looks like the housing market. You know the drill. It's Sunday so I get to ruminate about all stuff that isn't dry economics. The oldest member of the Millennial generation is 38. Not only do I not think that The Kids Today would want to be lumped with that age group, but their uncool parents are probably precisely members of that group! So what to name the generation that came after the Millennials? both "post-Millennials" and "Gen Z" are condescending and probably don't cut it with The Kids Today. Remember, "Gen X" was originally called "the baby bust," and Millennials were originally called "Gen Y" or "the echo boom," before catchier names were found. A good dividing point is whether or not you remember 9/11. If you do, and were born after 1980, you're a Millennial. If you don't, you're not. Most studies seems to agree with this, using 1996 or so as the cut-off year after which you are not a Millennial. A similar if less apocalyptic marker is the Columbine school shooting of 1999. If you remember it, you're a Millennial. If your schooling always included "active shooter" drills, you're not. But while the War on Terror or mass shootings have always been in the background for The Kids Today, everyday life has been dominated by something else. If you were born after 1996, iPods were always around -- and there's a good chance you owned one. So were cell phones. For most of your youth -- *always* for the younger part of this cohort -- iPhones and flat screen TV's have been around, and you probably have had one (or another smart phone) since junior high school. In fact you may spend most of your time glued to one! The term "iGeneration" captures this perfectly. iGeneration (or iGen) is a name that several persons claim to have coined. Demographer Cheryl Russell claims to have first used the term in 2009. Psychology professor and author Jean Twenge claims that the name iGen "just popped into her head" while she was driving near Silicon Valley, and that she had intended to use it as the title of her 2006 book Generation Me about the Millennial generation, until it was overridden by her publisher. In 2012, Ad Age magazine thought that iGen was "the name that best fits and will best lead to understanding of this generation". In 2014, an NPR news intern noted that iGeneration "seems to be winning" as the name for the post-Millennials. So henceforth when I examine demographics issues, I am going to use the term "iGeneration," the earliest polling as to which indicates that they hate Trump even more than their Millennial predecessors do!